Is Microsoft and/or Apple holding Linux back? May be, to some extent. However, the real problem is the Linux World itself - the platform and the community. The platform, because it is really not ready for the desktop. The community, because it constantly pushes "holier than thou" attitude for itself and the platform. It's great the way it is. But it's definitely not for the majority. And it's not bad in being so. By design it's a diy, modular, reveal-all, extremely scalable and customizable platform. If you love computers you'll love Linux on your desktop too. Hands down, it beats the competition in performance and security (the server space). It powers the web. It is a winner in the mobile space through Android where it's all about UX and apps (millions), no freedom of choice/chaos is there in terms of system components, it's extremey dumbed down, even to the extent that most users don't know it is powered by Linux kernel, let alone their knowledge of the subsystems. However, it's good as long as it serves some users. Technically, it is better in many respects. But that doesn't mean we'll forcefully shovel it down someone's throat. It is as different as any other OS is from another. It's rewarding too, if you love to work for your desktop, and don't mind occasional glitches. Forget the brain-fucked "Desktop of the Year" aspiration for the rest of your life. However, arguably it deserves better visibility and more adoption than what it enjoys now. 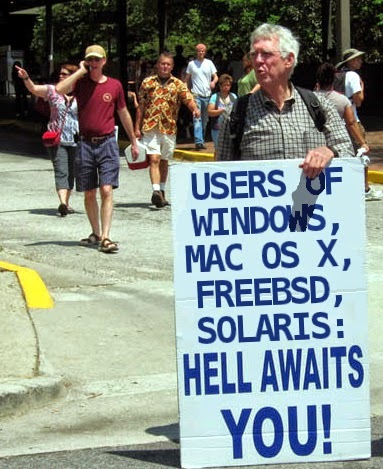 Had there been no zealotry, it would have been sitting on lot more desktops. Satisfaction is something that matches our preoccupation or exceeds it. Disappointment is something that falls short of the expectations or preoccupations. It applies to products, people and services. Often the evangelists would say Linux is best in terms of performance, usability, security, stability, beauty and couple other superlatives. Whereas there is no basis to boast that, definitely no quantifiable method to reach that conclusion. Had the evangelists not touted Linux out of proportion and bashed the corporates for no reason, it could have created a better impression. The approach should be - "If you won't mind investing some time, use it and check for yourself whether it fits your needs. It's different than Windows or OS X." When driven by false ego and/or obsession, please get down your high horses, understand it's just another OS. For fun let's see the tone and approach of the community. Here I'll site some examples from muktware, followed by my comments. Rest it's all up to you to judge. The title hides much than it shows. And what it shows is an utterly biased interpretation of the kind told million times before on those FOSS (FUSS) websites, and none saw the light of the day. Please read the post. Foremost, Microsoft is not going to offer its pot-boiler OS for Desktops and Servers for free. Microsoft did made a statement about offering it's OS for Mobile devices to the ISVs. Besides, desktop is not going to die any time soon. FYI, the corporate is not worried by linux community, because it knows the latter's direction-less approach. Given the current model of linux desktop, every ISV is damn sure that the community will never get its priorities right when it comes to desktop. What worries it is Google. No denying of the fact. If google adds some offline mainstream applications plus some options to window listing/switching, it'll definitely make a huge dent to the MS dominance. It's somewhat OK if you change the title to "Reasons why Windows XP Home users should upgrade to openSUSE". That "Home" in the suggested title is about "Home Users" and not "Windows XP Home". Similarity in looks is only thing that I could relate to in that post, nothing else. So much QA, bug fixing and years later XP is almost perfect (though reached EOL), it beats OpenSuse in polish, performance and stability. And please don't go by GIMP, LibreOffice, PiTiVi at workplace. A compromising home user may probably switch to OpenSuse KDE. Most of your XP machines can accommodate Windows 7/8 quite well, if you can take some time to nlite/vlite them. Google is your God. Do it to know how. True, only if you're a web-junkie. Else you'll still need Windows for a wide variety of tasks, the author somewhat reveals it at the end. Grossly misleading if you go by the title and lacking substance. What's newsworthy here? Microsoft is a for-profit organization. Wealth creation is no sin. And around Microsoft millions of people are employed. It's prospering them too. Ok, let's admit the company has done enough development already, and it tries to outdo Google in marketing. What's so wrong in that? 98% of users don't bother what this company does as long as they are happy with its products. Finally, the world view you have is quite different from the real world. Yes it did. So many others did too. And then some have undone. The rest will follow. For the reasons best described by Artem. They are considering the options, and it's one of them. But they have not moved yet. Besides, what good does it hold to inflate figures? The calculation also deliberately ignores the bulk licensing and corporate customization part. That's a few from one website who is SAVING THE HUMAN RACE from certain Microsoft or Apple epidemic. The web is littered with tons such pedestrian FOSS literature. I am trying to install PClLinuxOS Mate 64 Bit on My Lenovo Z570 with Nvidia GT520 graphics. The live CD loads on the laptop with quite a delay and i am able to install it. But when i restart to finish post-installation steps, it gets stuck, only blank screen. It installs and reboots nicely if i disable the GT520 graphics from bios and use only Intel graphics. Can you suggest some remedy pls? i'm not sure if it will work. but i'd suggest you to disable nvidia in bios (which you did). in this nvidia disabled mode install nvidia proprietary graphics, then on next reboot enable the graphics also install bumble-bee. if it doesn't work try another distribution. btw, thx for dropping by. Robert Pogson is a true linux zealot who lies and make up/distort statistics in Linux's favor. Not only that, he's also an ARM zealot. He truly believes that instead of PCs, everybody should only be allowed to have underpowered ARM devices running Linux or Android, regardless of what they want. He's in his 70s-80s but he writes like a 15-year-old. His regular posters are Douglas Smith aka 'dougman'(who use to owned and operated Jet Computing until the company folded probably due to financial reasons), 'ram'(Marschall Acoustics employee), and 'oiaohm'. These three will swallow whatever Robert says.